Just a stone’s throw from the UC San Diego School of Global Policy and Strategy (GPS), Luke Sanford is in his office on the third floor of the Social Sciences building on campus. A poster hangs on the wall beside his workspace that resembles the alphabet, but it’s statistical terms. A is for average, B is for boxplot, C is for correlation and so forth. As indicated by the poster, Sanford belongs to a different brand of the political scientists in his building. As a Ph.D. student in political science and international affairs, Sanford is incredibly driven by quantitative methods—he literally teaches the class on it as a teaching assistant at GPS. His research leverages remote sensing data and satellite imagery to discover how politics affect the way the physical world looks. He’s had no issue networking through the GPS’s faculty roster to do so. 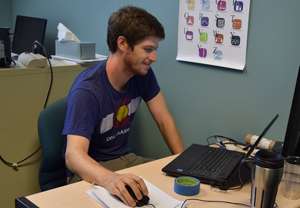 Some of the remote sensing data Sanford uses is borrowed from Assistant Professor Jennifer Burney, who he also regularly catches up with over lunch. 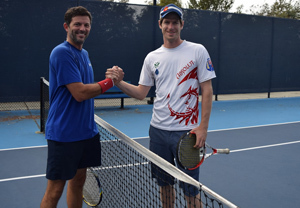 Assistant Professor Gordon McCord, who gave Sanford his crash course on geographic information systems, now plays tennis with him. Naturally, Sanford also is in close contact with his faculty advisor, Professor Emilie Hafner-Burton, who has welcomed him to participate in the Laboratory on International Law and Regulation of which she leads. In complement to our Storify tour of a day in the life of a Ph.D. student, we also asked our subject, Sanford, a couple of questions for more perspective on what enrolling in the program entails today. How did you end up at GPS to pursue your Ph.D.? “The quantitative emphasis at GPS is what drew me here. I studied political science in undergrad, but it lacked that quantitative component—this factored into my graduate school search and led me to GPS. Initially, I enrolled in the master’s degree program. But after my first year, I knew I wanted to get a Ph.D. The first year just cemented it for me. Are you originally from San Diego? “I grew up in Colorado. After earning my B.A., I took four years off of school before starting here. The first year, I worked for a water NGO in Sri Lanka. That was when I realized I wanted and needed to go to graduate school. I came back to the U.S., worked as a ski instructor for a year, went skiing every day. It was something I always wanted to do, and I had to do it before I went to graduate school or else it would never happen. I competed in some big-mountain freeskiing competitions. It was great for one winter, but the lifestyle didn’t really feel like what I wanted to do in the long-run. Have you pinned down the topic of your dissertation? “The subfields I’m studying in political science are quantitative methods and international relations. My dissertation will definitely involve things related to China, the environment and international institutions. To what extent do you interact with GPS faculty members? “Emilie Hafner-Burton is my advisor. Because she’s associated with both GPS and the Department of Political Science, she was a natural choice for an advisor. Plus, she’s interested in a lot of the same institutional questions I am. I’m planning on working with her in the Laboratory on International Law and Regulation. For incoming students about, what’s your advice for them to triumph the Quantitative Methods series? Since you have both perspectives, can you speak to some of the biggest differences between being a master’s and Ph.D. student at GPS? “In the master’s program, GPS does a really good job of teaching you a set of skills you can use to find a job. In the Ph.D. program, there’s not one single set of things you need to know. Everything is self-motivated. You have to come up with your own research topics and figure out how to research those things. If you need help, you need to seek out people to work with and help you learn the skills. You have to create your own structure. That also lends a lot of flexibility. This summer, for example, I haven’t been spending much time on campus. I’ve mostly been working from home. “I love outdoor sports. I use sports to take breaks from working. I get done with something, then I go for a run or do something fun on the weekends. I love reading fiction, so at home I read a bit and also enjoy spending time with my wife, cooking dinner and such. Visit Storify to see a typical day in the life of Sanford.